What is Banglalink Priyojon point? Priyojon is a loyalty based platform where Banglalink customers receive privileges and exciting offers, exciting discounts and physical gifts. How to activate Banglalink Priyojon point? Without any additional registration Banglalink customer can be entitled to different Tiers of Priyojon considering average usage(BDT) of the last 3 months of bill. How to check Banglalink Priyojon point ? Dialing *6000# from your Banglalink number. What are the different Tiers of Banglalink Priyojon customer? The different Priyojon Tiers will be set based on 3 months Avg. Usage (BDT). How to get gifts using Banglalink Priyojon point through SMS ? 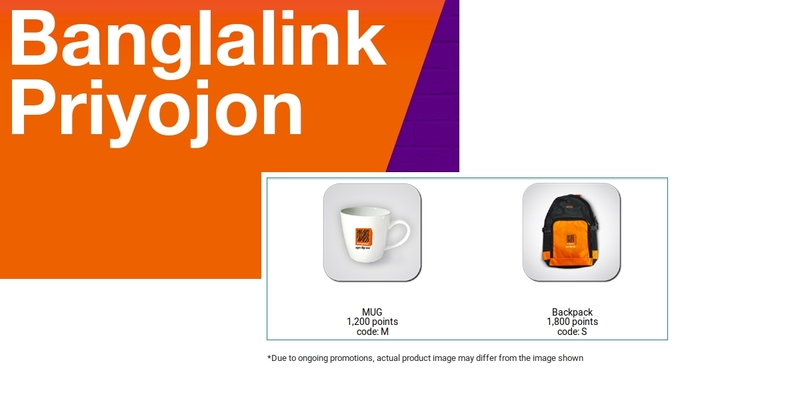 Banglalink customer can redeem exciting gifts with Priyojon points by writing code number of the gift and send the SMS to 5678. What are the ongoing gifts with Banglalink Priyojon point ?